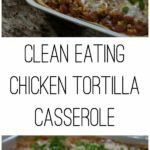 Clean up your next taco bake with this AMAZING Clean Chicken Tortilla Casserole. It’s so good and it’s perfect for your kids! Make it tonight! Be forewarned – it does take quite a bit of time to put together! Boil chicken breasts until cooked through. Learn how to boil chicken breasts here or if you have an Instant Pot, learn how to use that here. While chicken is cooking, preheat oven to 350 degrees F. In a large skillet (you will definitely want to use a large skillet), heat oil. Add onion, bell pepper, 1/8 tsp sea salt, and 1/4 tsp black pepper. Cook for 12-15 minutes, stirring occasionally until onions are lightly browned and bell pepper is soft. Add cumin, chili powder, and oregano. Stir to combine. Add garlic and jalapenos and cook until garlic softens, stirring frequently. Add in tomatoes and corn and cook until heated thoroughly. This may take from 1 minute to 4 or 5 depending on fresh vs frozen corn used. Reduce heat to medium-low. Let chicken cool. Once cooled, chop or shred chicken into fine pieces. In a small bowl combine 2 tbsp milk and potato starch until combined. Stir in remaining milk to combine. Add to skillet and bring to a simmer, stirring constantly. The mixture will begin to thicken. Add chicken and cook until heated thoroughly. Add remaining sea salt and black pepper. Remove from heat. Mist a casserole dish (I prefer ceramic) with olive oil cooking spray. Arrange half of the tortillas on the bottom of the dish as you would with lasagna noodles, overlapping slightly. Top with half of the chicken mixture and half of the cheese. 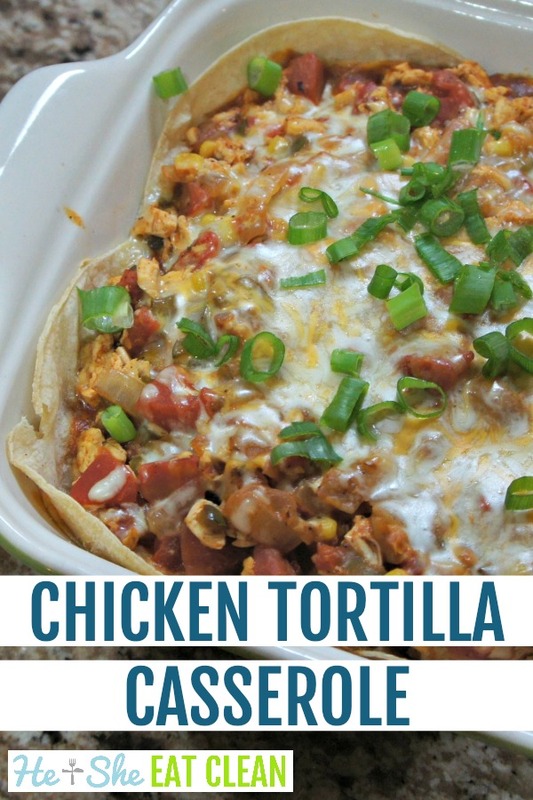 Add remaining tortillas in the same fashion, remaining chicken and cheese. Cover with foil and bake for approximately 35-45 minutes until heated throughout casserole. Allow casserole to rest for 5 minutes prior to serving. Add scallions/green onions on top of casserole. « Our Top Tips for Staying on Track Over the Holidays!